Taste test: These are thick-cut potato rippled chips that have a good salt and vinegar flavor without being too vinegary. 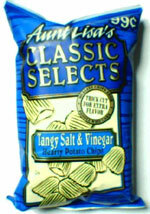 I think the rippled nature of the chips helps calm down the saltiness and/or the vinegar-iness of the chip. 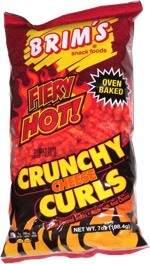 This would be a good starter chip for someone who doesn't like salt and vinegar chips that much. Smell test: A strong vinegary smell wafts up.